A few months ago, I was feeling physically unproductive. I would work out once in a while, but nothing too strenuous. My training schedule was lacking and I was beginning to feel tired all of the time. When I didn’t even have the energy to go on a hike with my friends, that’s when I knew that I had to change something in my lifestyle. Not wanting to go on a hike is not like me at all. I love hiking and being active. I’m in my mid-twenties and have always been quite sporty. Martial arts has always been something that I’ve been interested in. I used to watch Bruce Lee and Jackie Chan films all the time as a kid. Okay… so I guess you’ve caught on that I’m a bit of a nerd! After talking to some of my siblings, we decided that what I probably needed was a bit of challenge. And as I said, I’ve always kind of liked the idea of doing martial arts. I started doing kung fu two months ago and so far, I’m loving it. Joining kung fu is probably the best thing that I could have done for my fitness. My energy and motivation have improved so much. But besides the fitness benefits, there were actually other reasons for why I decided kung fu was the best fit for me. Commitment is a big part of any relationship. And let’s for a minute look at it as if you had a relationship with your body. Like any other relationship, you’re only going to get out of it what you put in. I wanted to become strong and improve my overall physical and mental fitness. If I devoted myself to going to classes, then with time I would see the changes in my physical and mental state. In the past, I used to jump around between different workout routines and exercises, trying out new things sporadically. But this is not what to do if you actually want to improve your fitness. What I needed was something more regular and stable. I wanted to nurture my body so I could grow as a stronger person. For me, kung fu was a challenge. I put on my training suit and decided to attend classes regularly twice a week. I have committed to practice at home everyday and learn the same three forms until they have been mastered before moving on to the next. As I said about relationships, you only take out what you put in. This means you have to know what you want. I wanted to see progress in my development. It drives me mad when I join an activity or a club with the intention of improving on something and after months of practice, the results are the same. When I joined kung fu, I wanted to see and feel the change. Progress is gradual. There’s no cutting corners or cheating. There is only a small measure of control you have over it. Progress is dependent on your own effort. That’s why I decided that I would train as hard as I could every chance I could. I pushed myself to perform the forms over and over. It’s been two months and my muscles have hardened only a bit and the forms haven’t been mastered, but I do feel the improvement. What I like about kung fu is that even though I’ve set a goal for myself, one that hasn’t been reached yet, I am still able to see some progress each time. There are just small changes in my form that show how I’ve improved. This feeling that I’m growing in small steps makes me feel strong. I grew up with four brothers, and while I never felt inferior to them, the difference in strength is noticeable. Here’s the honest truth, men and women are biologically different. The average man is built stronger than the average woman. This is a fact that has stung me ever since I was a kid and competing against my brothers in wrestling matches. I’m competitive and I don’t like to lose. Kung fu is a male dominated form of martial arts. But believe it or not, there are a number of kung fu styles that were developed by women. In fact, one of the five ancestors’ styles from Ngo Cho Kun was developed by a woman. Kung fu was mainly designed for people with smaller statures. I like to use my smaller frame to my advantage to catch my brothers off guard and throw them down. As a young woman of average build, it is important that I know how to defend myself. Although I’ve been in kung fu a short time, it has given me confidence and strength. I’m gonna be honest. I’m an overactive girl with no focus and very little discipline. I don’t much care for practising, especially when it’s the same thing over and over, so why did I think kung fu would be right for me? The basis of kung fu is to achieve mastery through your own hard work. To do this, you must focus on the basics and repeatedly practice the simple forms over and over until you become a master at them. Bruce Lee had a point there. If you practice one punch 10,000 times, then that punch will become habit. In a fight, you don’t have much time to think, you need to rely a lot on natural reflex. Since joining kung fu, I really look forward to going to training and getting sweaty. I always get a kick of adrenaline when I get to learn a new technique or apply break dancing in my forms. Kung fu is something I love to do because I have so much fun doing it. Next: Next post: How to Knock an Attacker Down with ONE PUNCH! Nice! Keep training hard and you’ll do great. I especially liked the part about treating the body like a relationship (lord knows I have unhealthy habits :P). One note: I’m not sure if you meant it this way, but Lady in the Green Dress (Xuan Nu) is not one of the five ancestors in Five Ancestor Fist. She is not alleged to have her own Kung-Fu system to contribute to our composite system, and is noted to rather add grace, softness, and humility to the system (as well as Dim mak, the death touch according to some sources). It’s kind of ok to call her an honorary or sixth ancestor (assuming who you’re talking to has enough precursory knowledge of Five Ancestor Fist) but honestly historically she’s not given a lot of credit probably due to the Chinese culture at that time. Theres no telling how much she effected the Ngo cho system, and some say she’s responsible for bringing the five ancestors together (though I don’t know if one repersentative from each system came to collaborate or if was more (or possibly less, with one person knowing multiple styles)). The titicular five ancestor systems are: Hou-quan (Monkey style), Baihe-Quan (Crane Style), Tai zu-quan or Tai Chor (Emperor Style), Luohan/Arhat Quan (TL: Bodhisattva (~Buddhist saint) fist/style), and finally Da Mo/Bodhidharma’s (Patriarch of Chan/Zen Buddhism) breathing and internal aspect (strictly speaking he does not have a MARTIAL arts style attributed to him). Sorry that was probably excessive information for you who probably already are familiar, but I figure if someone randomly comes across this page it would do well for posterity. Side note one: the reason there are so many parenthesis is not only because I have excessive thoughts, I want to jam in, but also because there are several translations used even within the same language (different dialects and different transliterations). For example (as I’m sure the author knows), Five Ancestor Fist is sometimes expressed as Ngo cho kun (or simply Ngo Cho) or it is Wu Zu Quan. 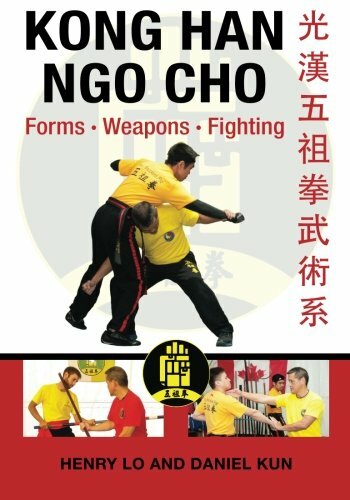 What may be confusing for a new practitioner however is that, while way back when, there wasn’t a real difference between Ngo Cho and Wu Zu Quan, however now there is a respectful difference in many of the forms and flavors; with Ngo cho kun being represented with a large rooting in the Philippines branch while people who use Wu Zu Quan as parlance tend to be from the unilateral Chee Kim Thong branch (sometimes known to Ngo Cho as Bai Yufeng style (Bai Yufeng being Chee Kim Thong’s teacher.)) I don’t know enough about the Ngo Cho branch to talk about stylistic differences within itself. Side note two: Da Mo does not have a martial arts system directly attributed to him, he however is credited for the creation of Yi jin Jing and Xi Sui Jing (Muscle/Tendon Change Classic and Bone Marrow Washing Classic) two Chi Gong exercises which collectively generated iron shirt (or iron body) method and were developed to help make monks more fit such that they could meditate for longer periods (talk about single minded, ha ha). I have heard from a kung-fu brother that these method in turn inspired the Shaolin Martial Arts, but I haven’t seen any other sources saying that. Lastly, I would like to clarify, that I definitely respect you as a martial artist and am not trying to Mansplain or talk down to you. I’m just sincerely happy to find a place to share my thoughts on wu zu quan. If anythings unclear or you want to know more, feel free to ask (though I’m no authority) and I’ll try to answer or direct you to someone who might be to. Of course if you have contradictory or elaboratory information feel free to share it. I have 5 years of experience but I’m still learning new things all the time. I still consider myself a novice practitioner. Tl;dr – Lady Green Dress is considered an indirect founder of Ngo Cho, but not one of the five. The Lady in Green is consider the sixth ancestor under the Bai Yu Feng NCK lineage according to their story Bai Yu Feng a famous and an expert martial artist from Northern Shaolin temple during the early Ming dynasty 1300’s formulated the Five Elements and Five Animals system later also to include a system of Five Ancestors Fist. Bai Yu Feng added the Lady in Green which is also known as Xuan Nu after being bested in martial art, the style of the Lady in Green was soft and focus on pressure point “dim mack” attacks. The 1800’s Five Ancestors Fist founded by Li Jun Ren and Chua Giok Beng that included the Fujian White Crane which was develop in the 1700’s centuries later after Bai Yu Feng did not include the mysterious Lady in Green. Before Li and Chua develop their version of NCK the prevalent martial art system was the Tai Cho both Li and Chua were Tai Cho masters so was most of the masters in Fujian province. Tai Cho martial art was the dynasty martial art in today’s standard it is the national martial arts that is why old school martial arts club always use the term “Kok Sut” 國 術 meaning National Art. Tai Cho was an amalgamation of all the known martial arts at that time before the development of Five Ancestors Fist the words Five Ancestors was already being used as a none martial art but as a form of worship, veneration or ceremony to the Five Ancestors those five ancestors relate to ancient China’s religion, politics, philosophy, emperors (that are believed to be blessed from the Heavens), deities and other mythological gods and goddesses. An altar of the Five Ancestors would be found in most old traditional Chinese martial art schools in that altar can be found the (1) Tai Cho representing emperor veneration, (2) Lo Han representing the immortal deities and later the warrior monks of Shaolin, (3) Guan Nim the patron saint of ancient China, (4) Xuan Nu a female deity that was known for her healing prowess. (maybe this is were the Xuan Nu Lady in Green is related to?) and (5) Da Mo the founder of Buddhism in China. Li Jun Ren and Chua Giok Beng development of their respective Five Ancestors would be about martial arts not about the spiritual ceremony, veneration or worshipping of the Five Ancestors. So the word “Fist” was added to become Five Ancestors Fist. Followers of Chua Giok Beng NCK and Li Jun Ren will take not have or will remove the altar of the Five Ancestors from their schools. Many Tai Cho martial artist will join either Li Jun Ren of Yong Chun NCK or Chua Giok Beng Ho Yang Pai NCK others will not those who did not join either the two were considered as Tai Cho NCK. Bai Yu Feng followers will comprise the fourth NCK lineage, their followers after the fall of the Ming dynasty to the Manchurian Qing dynasty will migrate and settle in Fujian and it is believe that centuries later descendants of the Bai Yu feng will morphed, adapt, embraced and integrate with the Fujian martial art system that would include the Fujian White Crane. Fist. Bai Yu Feng added the Lady in Green which is also known as Xuan Nu after being bested in martial art, the style of the Lady in Green was soft and focus on pressure point “dim mack” attacks. Li Jun Ren and Chua Giok Beng development of their respective Five Ancestors would be about martial arts not about the spiritual ceremony, veneration or worshipping of the Five Ancestors. So the word “Fist” was added to become Five Ancestors Fist. Followers of Chua Giok Beng NCK and Li Jun Ren will not have or will remove the altar of the Five Ancestors from their schools. 4. Da Ma / Lo Han. Da Mo and Lo Han were combine as one because accordingly both originated from Shaolin Buddhism founded by Da Mo. Da Mo’s breathing exercise and the warrior monks martial arts will develop side by side. 5. Xuan Nu.female nun that is an expert martial artist on the use of pressure point techniques. It is important to note that a female deity Xuan Nu also known as 九天玄女 Nine Heaven Mystery Lady existed she worship and venerated as a goddess by ancient China’s dynasty religion. She is perceived to possess the power of nourishment, vitality, health and long life.It is not surprising that the Xuan Nu related martial art figure would possess martial art skills focus on pressure point technique. Ngo Cho Kun is a style of Shoalin Kung Fu originating in Southern China. Ngo Cho Kun roughly translates to “Five Ancestors Fist” and was named to honour the five kung fu ancestor styles.